The $1.127 billion Royal North Shore Hospital (RNSH) and Community Health Services Redevelopment is an award-winning demonstration of expert construction management. 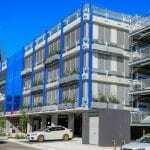 Undertaken by Thiess, the works include a new 7 level multi-storey, 567-space car park covering 23,000m2. More than 1400 lineal metres of the RHINO-STOP® car park barrier was installed along the perimeter, split level and ramp locations. At the perimeter locations, RHINO-STOP® barrier was configured with coloured perforated panels, providing an integrated barrier and balustrade system. Standard mesh infill panels were used at the split level locations.